Joe Pryor was a meat salesman and the son of the managing director of a chain of stores. He was killed in an artillery attack on his unit on a “quiet” day, in May 1918. Harold Joseph Pryor (known as Joe or Joey) was born at 13/15 King Street, Hammersmith on 14 June 1891, the third child and oldest surviving son of George Joseph Pryor (known as Joseph, 1864–1941) and his wife Emma Selina née Piper (1863–1924). Joseph Pryor had been born in February 1864 in Great Dunmow, Essex, the eighth of twelve children born to Henry Wilton Pryor, a master tailor, and his wife Ann née Hockley, although only four of his siblings survived into adulthood. Eight of Joseph’s siblings died of “consumption” (tuberculosis) aged between 21 and 2 years old. Henry Wilton Pryor was declared bankrupt in 1868 and died in 1879, aged 51, when Joseph was only 15. These tragedies and misfortunes all had a significant impact on Joseph ‘s life. Having moved to Hammersmith, London where he was employed as a grocer’s assistant, Joseph returned to Essex to marry 23-year old Emma Selina Piper at St John the Evangelist’s Church, Bush End, near Takeley, Essex (close to the site of the present day Stansted Airport) on 7 November 1886. Emma, from nearby Brewer’s End, was the daughter of George Piper, described as a carpenter and shopkeeper, and Elizabeth née Cornell. 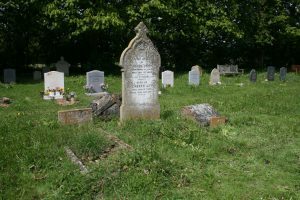 The couple settled in Fulham in London, where their first child, Harry George Melton Pryor was born in the spring of 1888; sadly, Harry died in May 1890 with tubercular meningitis. His sister, May Lena, was born in Fulham in May 1889. The couple’s second son, Harold Joseph was born on 14 June 1891, with four further children being born over the next seven years, two of whom died as children, including Lionel who died of a fractured skull on 24 April 1906, as the result of a fall when he attempted to slide down the banisters at “Butler’s Famed Emporium” in Hastings. At the 1891 census, Joseph Pryor described himself as a “butchers’ manager” living at 13/15 King Street, Hammersmith, adjacent to the “Hop Poles” public house, with Emma and May and three of Emma’s nieces, all employed as cashiers, and 13-year old maid, Eliza Comber. In October 1897, Joseph and his brother Herbert Edwin were appointed as directors of Palmer’s Stores Limited when that company was floated on the London Stock Exchange. As well as the business at King Street, Hammersmith, the company had butchers’ shops in Clapham, Pimlico, Kilburn, Fulham and Harrow Road. The well-known business of Palmer’s Stores, Hammersmith, under the management of Mr. George Joseph Pryor, has grown into a very large concern, earning constantly increasing profits, the net income for the year ending 30th August, 1897 … having accounted to £7,767. In about 1899, the couple moved to 3 Exmouth Place in Hastings, although they also retained property in London, latterly at 7 Chiswick Lane, Chiswick, where the family were resident in 1911, together with two servants, Charles & Ethel Bunn, butler and cook respectively. Nine years after the birth (and infant death) of her daughter Gwendoline, Emma, aged 43, gave birth to her eighth child, Ena Violet, born at Hastings in January 1907. At the time of the 1911 census, Joe Pryor was living at 26 Cleveland Avenue, Chiswick (a short distance from his parents) with his uncle, Frederick Clarence Pryor and aunt, Alice, and their two children. Both men gave their occupations as “meat market salesman”. On 13 October 1898, George Joseph Pryor (aged 34) and two of his brothers, Harry (aged 48) and Herbert Edwin (aged 36) were initiated together into Hammersmith Lodge No 2090. The three brothers, all described as “provision merchants”, were passed together to the second degree on 10 November and raised to the third degree on 12 February 1899. In September 1906, Joseph joined Derwent Lodge No 40 meeting at St. Leonards. In December 1912, Joseph was one of the founding members of The Lodge of the Men of Sussex No 3712, becoming its Worshipful Master in 1917. Joe Pryor was initiated into The Lodge of the Men of Sussex on Friday, 16 February 1917. Being anxious that Joe should become a Master Mason before he was sent abroad with the British Expeditionary Force, his father arranged to have him passed to the second degree in his mother lodge, Hammersmith, on Wednesday 11 April 1917. Joe was raised to the third degree at The Lodge of the Men of Sussex by his father, now Worshipful Master, on Friday 15 June 1917. In the absence of his service records which have been lost, there are few precise details of Joe Pryor’s military service. He signed on as a volunteer at Fulham House, probably on 31 August 1914, joining the 2/25th Battalion of the London Regiment. The 2/25th was part of the 25th County of London Cyclist Battalion which was formed by Colonel Gilbertson Smith in August 1914, and on 30 August, men from the battalion picketed the roads out of London to “persuade” cyclists to sign up. The battalion spent the next two months training in Fulham until 5 November, by when the new recruits were equipped with uniforms and rifles. 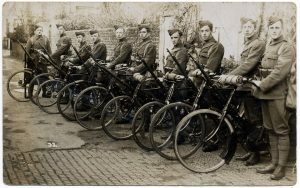 On 5 November, the battalion made its way by bicycle from Wandsworth to East Grinstead, and then to Lewes. The battalion spent the next six months patrolling the Sussex coast, monitoring shipping and looking for suspicious activity. 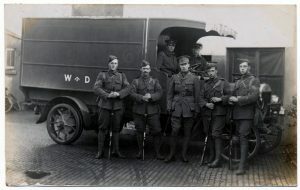 Corporal Joe Pryor (on the right) at Worthing in November 1914. 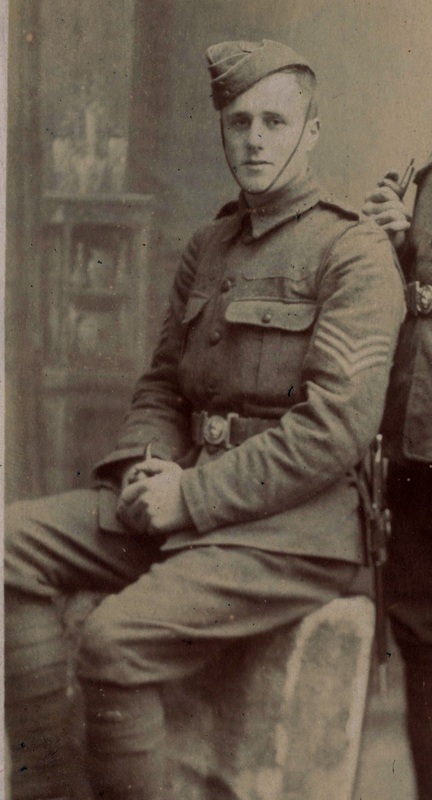 Joe Pryor was soon promoted to Corporal and to Sergeant at the end of November 1914. On 19 April 1915, the battalion was moved by train from Lewes to Norfolk where they were to carry out similar coastal patrols on the coast from Cromer through Wells to Snettisham, near Hunstanton, on The Wash, later moving to Suffolk. During their time in East Anglia, they encountered Zeppelins over Wells and Holt, German “tip and run” raids on Great Yarmouth and Lowestoft, and rumours of an invasion at Weybourne Beach. Joe remained with the 2/25th Battalion in East Anglia until early 1917, when he was transferred to the 9th Battalion, The London Regiment, part of the British Expeditionary Force. He remained in England until August 1917, before being shipped out to France, where he was immediately transferred to the 5th Battalion. The 5th (City of London) Battalion (London Rifle Brigade) was part of the 169th Brigade in the 56th (London) Division, and at the end of November 1917, they participated in the Battle of Cambrai. On 2 April 1918, Joe was attached to the 12th Battalion, Rifle Brigade, who had suffered heavy casualties in March as the Germans pushed the front line back over 70km from Cambrai across the River Somme to within 20km of the strategic city of Amiens during “Operation Michael”. The battalion had been holding the bridge over the River Avre at Thennes, 17 km south-east of Amiens, but withdrew on the night of 1 April to Quevauvillers, 35 km west. Joe was part of a small draft of men who were transferred to the 12th Battalion. 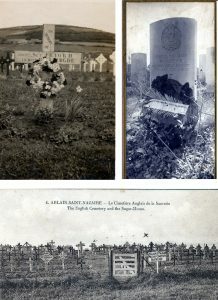 Their arrival on 2 April is recorded in the battalion war diary: “A number of men who had been attached to various other units joined during the afternoon.” Over the next few days, the battalion moved firstly to Revelles and then to Dromesnil, before arriving at Maigneville, 21km south-west of Abbeville on 11 April, where they rested for a week, re-organizing and undergoing training in rifle and bayonet use, firing practice etc. After 17 days away from the front, the battalion returned on 18 April when they were taken by bus 85km north-east to Aubigny-en-Artois, from where they marched 6km to their new billets at Estrée-Cauchy (known universally as “Extra Cushy” by the British Tommy), 18km north-west of Arras and about 12km behind the front line. The battalion remained at Estrée-Cauchy until 1 May, during which time they underwent further training, including in night operations. On 27 April, an inter-company football competition was arranged. On the second day of the competition, play had to be suspended “owing to the heavy casualties in footballs”. An attempt to finish the competition the following day was again called off after only 20 minutes because “unfortunately the footballs were again unable to stand the pressure of the hard game”. On 1 May, the battalion moved 11km to the front line and were billeted at Souchez, where they took over a sector from Princess Patricia’s Canadian Light Infantry and the 49th Canadian Infantry Battalion. Most days they came under light artillery fire from the enemy; night patrols were undertaken, which made occasional contact with enemy patrols. Quiet. Enemy artillery more active than usual. 1 Sergeant killed. 1 Corporal and 4 Riflemen wounded (shell). 1 Rifleman wounded by sniper. Poor old Joe Pryor (Sgt Pryor) was cut nearly in two pieces by a piece of shrapnel some 12 months ago, but casualties among the old ‘uns transferred to France lately are few. 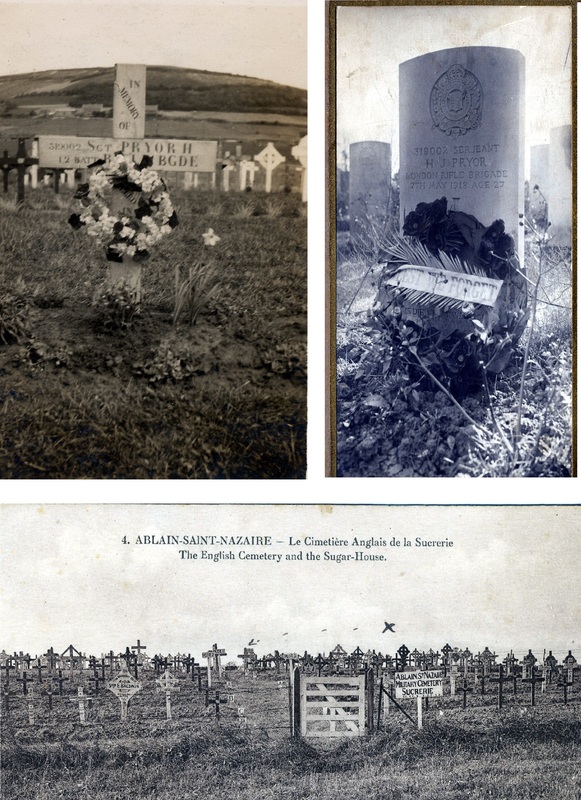 Joe was buried at Sucrerie Cemetery, Ablain-St. Nazaire, close to where he was killed. He was awarded the Victory Medal and British War Medal. 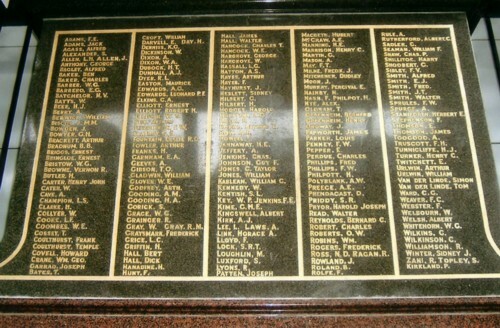 As well as the Masonic Roll of Honour, he is commemorated on the war memorial at Smithfield Meat Market. 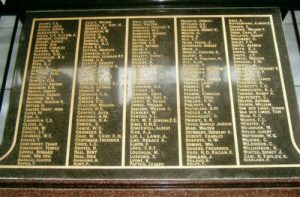 At the June 1918 meeting of The Lodge of the Men of Sussex, condolences were expressed by the lodge brethren to Wor. Bro. George Joseph Pryor on the death of his son, “killed in action near Arras”. Joe is also commemorated on a family memorial in the churchyard at Holy Trinity Church, Takeley near Great Dunmow, Essex. Joe’s two surviving brothers both served in the army during the war. Reginald Herbert Pryor, born October 1892, served with the 4th Battalion, The London Regiment, reaching the rank of Corporal. Reginald died in East Preston, Sussex in May 1964, aged 71. Guy Frederick Pryor, born January 1895, enlisted in the 1/25th Battalion of the London Regiment, where he also reached the rank of Corporal, before transferring to the 1/9th Battalion, Middlesex Regiment. He died in west London in 1971, aged 76. Joe’s parents, Joseph and Emma died at Brentford, Middlesex in November 1941 and December 1924 respectively. His younger sister, Ena Violet, died in January 1920, aged 13 from peritonitis and congenital heart failure. His elder sister, May Lena married Thomas Kember in December 1914 and had six sons and a daughter. May Lena died in 1972, aged 83. 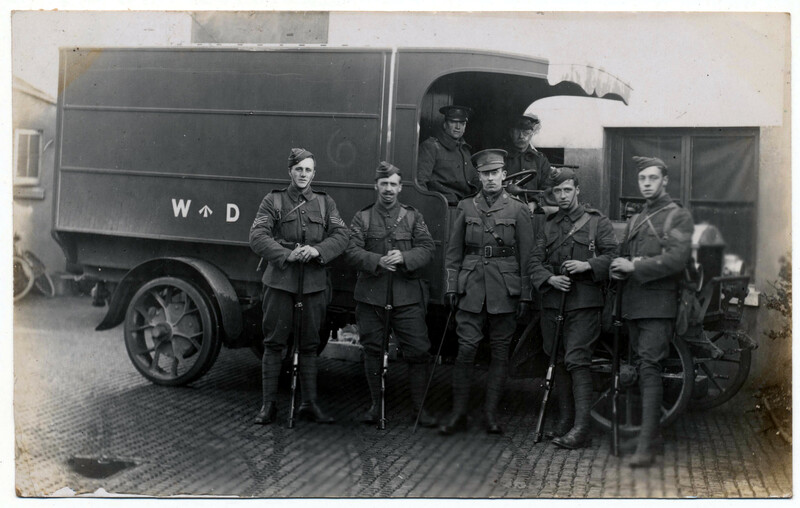 The members of the Great War Forum, for help in understanding Joe Pryor’s military history.